Purabi Baruah of Tezpur, Assam is fighting for life since the last 45 days and we all want to help her to emerge as the winner. Daughter of Late Joy Chandra Baruah and Mrs. Nilima Baruah. 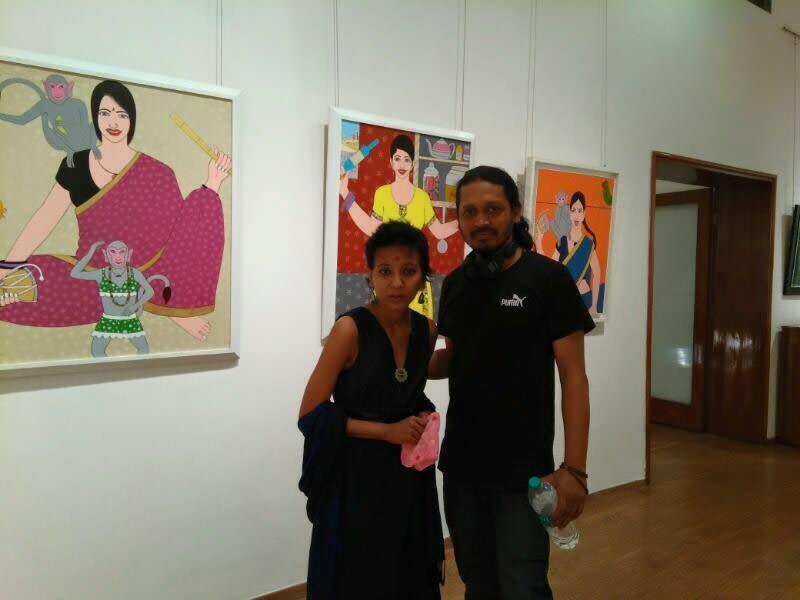 Married to Mr. Harekrishna Takukdar, Barpeta, Assam, a visual artist by profession. A renowned Odissi and Satriya dancer who made Assam and India proud in the recent past by representing the country in different national and international platforms. The first Assamese woman to receive the Dora Research Fellowship to conduct research as a visiting PhD scholar at the University of Tartu, Estonia in 2012. Currently she is pursuing her PhD in Folklore from North-Eastern Hill University (NEHU), Shillong, Assam. Purabi is in the International Hospital, Guwahati, Assam and in ventilation since 06/Aug/2016. She is fighting for life for the last one and half month. It has been tough; but she refuses to surrender so easily. Her attitude has infused hope in the minds of her family and well wishers and the doctors. She needs your help to fight this battle out. 18/Jul/2016: she was operated for an ovarian cyst surgery in the Hayat Hospital, Guwahti, Assam. In this modern era of medical science, this was supposed to be a simple surgery. But fate had something else in store for her. She developed septicaemia (blood poisoning) as her bowel got injured during this surgery. 23/Jul/2016: On the 5th day from the first surgery, doctors from the Hayat Hospital had confirmed the leakage in her intestine and performed another surgery. But they failed to block the leakage and instead put drainage artificially. During this whole process her health got deteriorated. She developed multiple organ infection, acute respiratory distress syndrome (ARDS) and Pneumothorax and also had a major cardiac arrest. 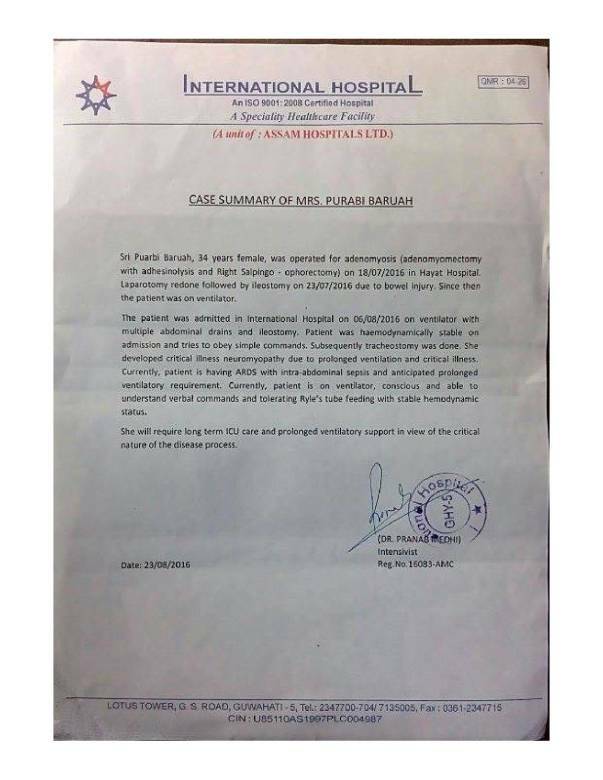 The family had to shift her from the Hayat Hospital to the International Hospital, Guwahati, Assam for better treatment and management as per the Hayat Hospital’s recommendation. Now, Purabi is in the International Hospital, Guwahati, Assam and in ventilation since 06/Aug/2016. Harekrishna, Purabi’s husband, has left no stone unturned to keep her fight alive and support her treatment. But it has not been easy for him to make the ends meet. 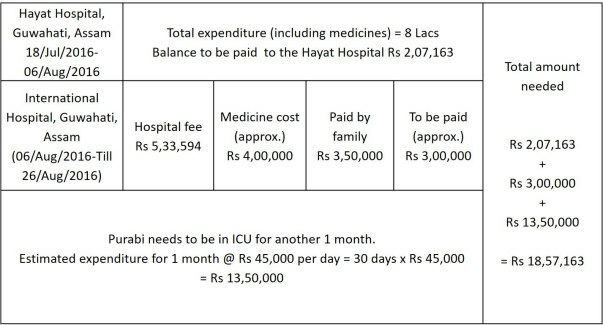 Since admitted to the International Hospital, her medical expense has been around Rs 45,000 per day. Please come forward, join hand in hand and help Purabi and the distressed family at their hardest phase of life. We hope to raise enough money to help Purabi so that she can come out of this battle, go back to dance and lead a healthy life once again. Purabi is recovering under specified medications, physiotherapy and exercises. Slowly but confidently she is gaining her strength back with the help of speech therapy, specified treatment of Gynae, a diet with proper nutrients, a regular routine. There remains one more final check-up. She becomes tired but its less day by day and now she can walk by herself. Thank for coming forward to help her. This would not have been possible without your support. 8 long months and we are here. Purabi @ Delhi for her first checkup. Thanking you all for standing by her side.